You’ll want to check out this ultimate list of the best adult coloring books if you’re looking to unwind after a stressful day. Apparently, one of the latest trends in combating stress involves coloring, just as you did when you were a child. Coloring books for adults are specially designed to systematically melt your stress away, one color at a time. Stress often put your mind into a flux of negative thoughts. When you’re overwhelmed by stress, you’ll instinctively hop from one thought to another, intensifying the emotion in the process. This does nothing to relieve you from the anxious feelings but instead traps you in a paralyzing mental state. Coloring provides an effective way to break the chain of anxious thoughts, just as meditation does. It ground your mind on the physical act of coloring and building focus at the same time. In fact, the therapeutic benefits of adult coloring books are backed by various studies. A study conducted by researchers at the University of Otago in New Zealand shown that participants who are subjected to coloring activities for a week shown significantly lesser depressive or anxiety behavior. Another study implies that the stress-reducing effect lies in the process of artistic expression itself. The study shows that the majority of the participants who take part in art-making activities show a reduction in their cortisol level. Adult coloring books is a popular stress-busting remedy for all the good reasons. You Can Train Mindfulness – If you’re into mindfulness meditation, coloring is an ideal activity to further develop mindfulness for daily activity. You can do so by developing awareness on your fingers as it lifted the crayon and applying it on the paper. Reconnects With Your Childhood – The act of coloring can connect you to the joy of childhood. It brings you to a state of mind where worries are forgotten and all that matters is enjoying the process of coloring itself. 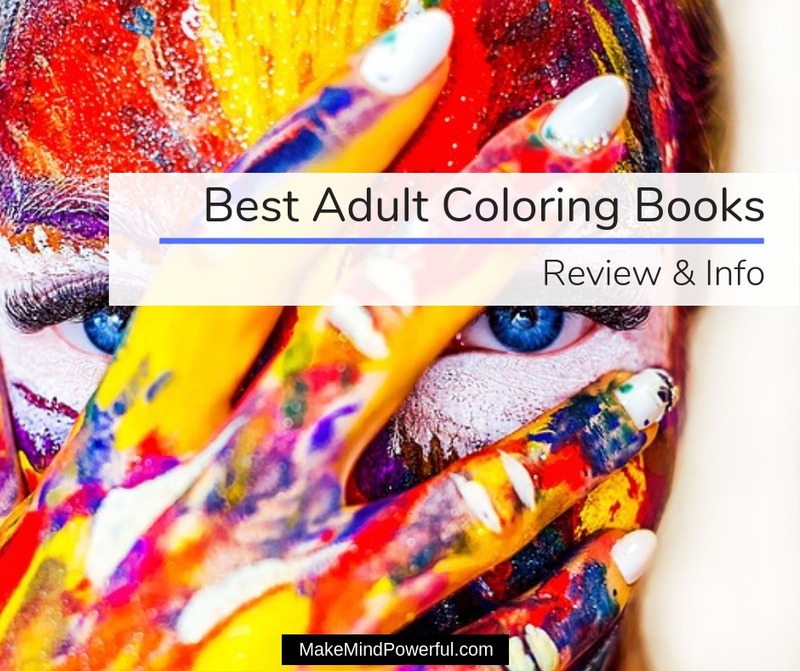 There are no hard rules in choosing adult coloring books, but there are some criteria worth considering before buying a coloring book for yourself. Theme and Style – There are basically hundreds of themes available for you to choose from. If you’re a fan of Star Wars, coloring your favorite characters is definitely a plus point. 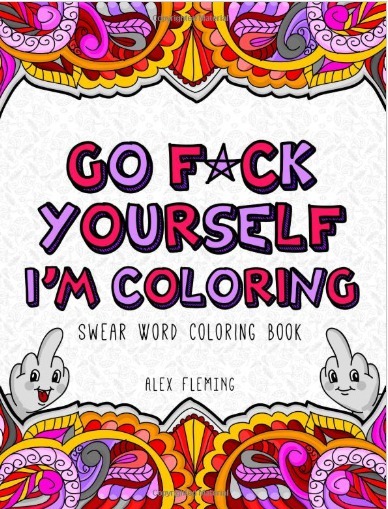 Or if you don’t mind some colorful languages, swear words themed coloring book is a great choice. Single Sided – You’ll get a better experience when the drawings are printed on a single-sided page. Number Of Illustrations – If you’re spending most of your time coloring, you may want to get coloring books with a larger number of pages or illustrations. Quality Of Paper – Most adult coloring books are meant for color pencils, crayon or marker. But if you’re fond of watercolor, you’ll want to get coloring books that are made for it. Price – The cheapest coloring book seldom offers the satisfaction of adult coloring books. You don’t want subpar quality material or poor designs to take the fun out of coloring. It’s worth to invest in a premium coloring book that offers a calming experience. Feedback – There’s no harm in checking feedbacks of fellow customers of a particular coloring book. You’ll get a rough idea if the theme and designs are suitable for you. Sometimes, a popular adult coloring book may not fit your preference at all. You may be able to buy adult coloring books in your local bookstore. But if you prefer buying online, Amazon, the largest online bookstore in the world, is probably the better choice. You’ll get to take a peek into some of the pages and read reviews of users who have bought the books. 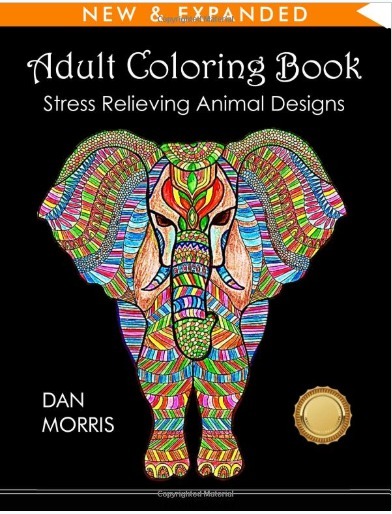 Important: If you’re suffering from chronic stress, you’re advised to consult your doctor instead of solely-relying on adult coloring books. This article is not written by a medical professional, health expert or a doctor. Thus, it is not a substitute for medical diagnosis or treatment. With possibly thousands of different types of adult coloring books on Amazon, it will take a while to browse through every option. I’ve personally picked out my favorites that are unconventional yet provides the needed stress relief. When you’re stressed to the limit, especially after a grueling meeting with your boss, you wish that you can swear all your stress away. Unfortunately, you may need to hold your choice of swear words off until your boss is out of range. This adult coloring book can be the next best thing than swearing out loud. There are over 20 single sided pages containing bold illustrations that carry inspirational message littered with swear words. You’ll find your anger and stress subside as you fill the pages with vivid colors. Each illustration is printed on a single-sided page with the rear side covered in black. This means you can paint with your choice of coloring tools without the risk of smearing the next page. 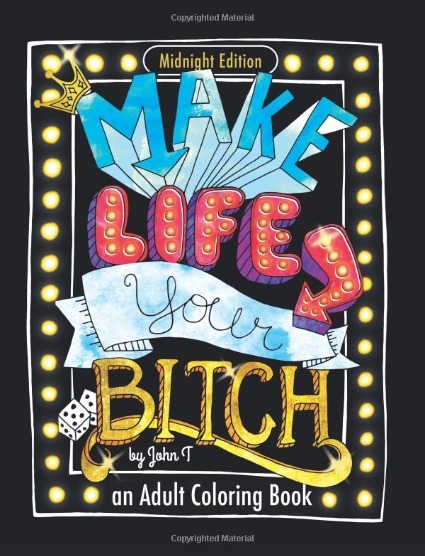 If you find the blend of bad language and motivational phrase a good mix, this is a great coloring book for you. This coloring book is the one thing you’ll want to have when you’re overwhelmed by endless tasks and a random phone call seems to push you over the top. Of course, this is assuming that you find the profanities used in the book entertaining rather than offensive. There are 26 pages of craftily designed caricatures with accompanying swear words. The illustrations are filled with patterns that are not too tedious to color. Besides channeling your negative energy into the book, you’ll find that you develop focus as you color pages after pages. The papers used in the book are considerably good quality, for the price that you pay. It is not too grainy and you’ll have no problems with crayons and color pencils. It’ll also be a great gift for a friend or family who find colorful language humorous. This animal-themed adult coloring book offers a tamer flavor than their swear words counterparts. It has 50 different animals of various sizes for your to color. In a way, it brings you closer to mother nature while calming your stress down. You’ll find that the animal images in the books vary from the level of complexity. The images are drawn in a mosaic style that allows you to take your creativity to the maximum. You’ll find the process of filling the intricate pattern of the animal a soothing experience. 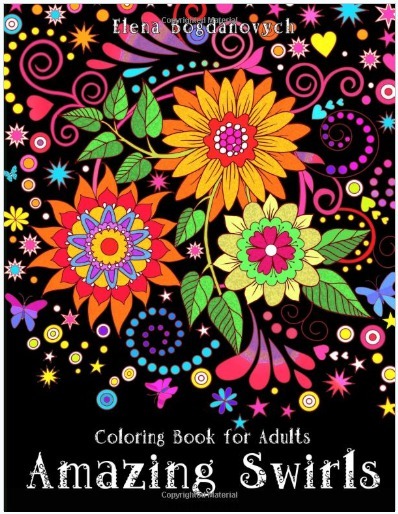 Besides color pencils, you can also use gel pens on this coloring book. The paper quality is good enough to prevent the gel pen from bleeding to the next page. Some parts of the images are pre-shaded but not in an overwhelming manner. If you’re looking for a combination of beautiful art, intricated design, and an effective stress-buster, the Amazing Swirls fits well as a coloring book. It has an assorted picture of floral and animals depicted in swirl style design. The pictures are printed on single-sided papers and you can color away with markers, crayons or color pencils. There are no issues of the colors bleeding onto the next drawing. The pattern is well-detailed but not in an overwhelming manner that would rob you of the joy of coloring. Some of the illustrations are pretty cute, and this coloring book is an ideal start for beginners who are looking to relieve stress through art. The right balance of broad and fine areas will keep you both challenged and entertained. The book also comes with a complimentary PDF of more illustrations that you can print out and color. There is something uplifting about taking a walk in the garden as butterflies flutter over the blossoming flowers. But when there aren’t any gardens you can visit, this adult coloring book is the next best alternative. 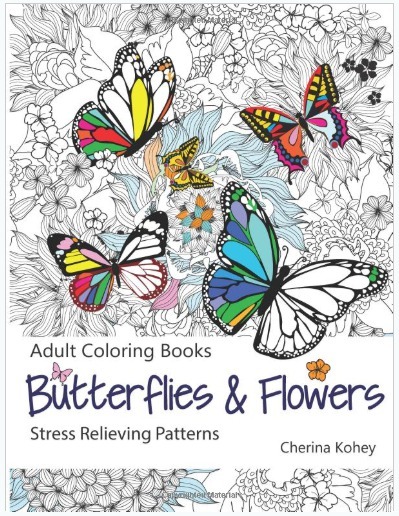 As the name implies, Butterflies & Flowers offers creative nature-themed illustration for stress relief coloring. The book features 30 unique butterflies illustration with varying complexities. The butterflies are also depicted in different expressions, with cuteness in some and creative style in others. The images are printed on single side pages. Crayons and color pencils work fine but if you’re coloring with marker or gel pens, you’ll need to place an additional layer of paper in between the images to prevent bleeding. Overall, it’s a decent adult coloring book where you can bring the butterflies to life with touches of colors. As you find yourself absorbed in coloring, any anxious feeling will naturally subside. Sometimes, a little word of encouragements is all it takes to strip you of all the stress and reinforce the belief that you have what it takes to carry on. 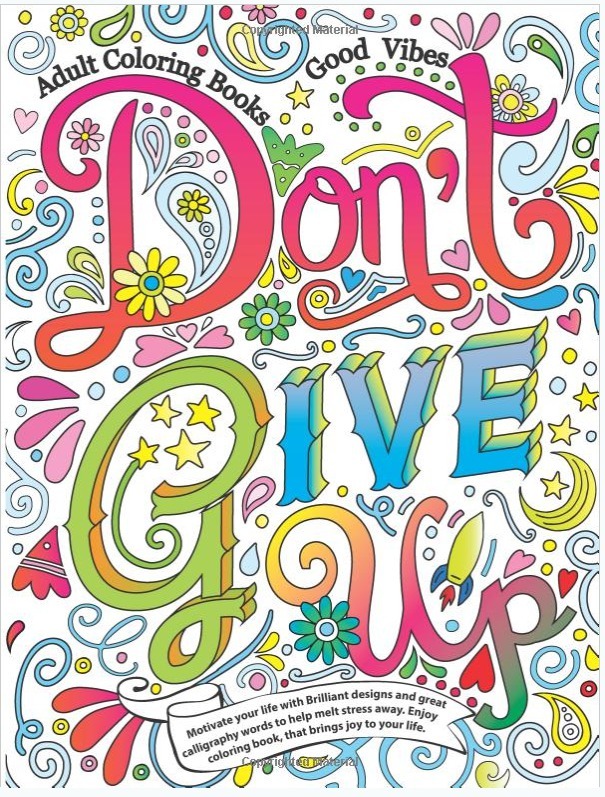 Don’t Give Up is an adult coloring book that uses motivational phrases as its primary theme. It features a big open design with great calligraphy words to color on. If you prefer less intricated artwork, this is the right coloring book for you. The style of the illustration is very much suited for teenagers and you may want to get one as a gift for one. You can use both color pencils and crayons but avoid markers as the pages are a little to thin for that. Other than the fact that the pages are not perforated, you’ll find that coloring on the book is a healing process. With all the different themes, it can be hard to decide on the exact adult coloring book. If you’re torn between choices, this coloring book by Cindy Elsharouni can spare you the hassle. It has assorted illustrations that include mandalas, animals, butterflies, flowers and motivational quotes. The book is well suited for people of all ages. You’ll find that the book contains the best designs from Cindy, a professional artist with more than 2 decades of experience. Coloring on the book is a great way to de-stress after a busy day. The pages are made of high-quality paper and can be individually separated. The artwork has a well-balanced intricate pattern that is not overwhelming. If you’ve created some masterpieces out of the book, you can tear them off and proudly put on for display. 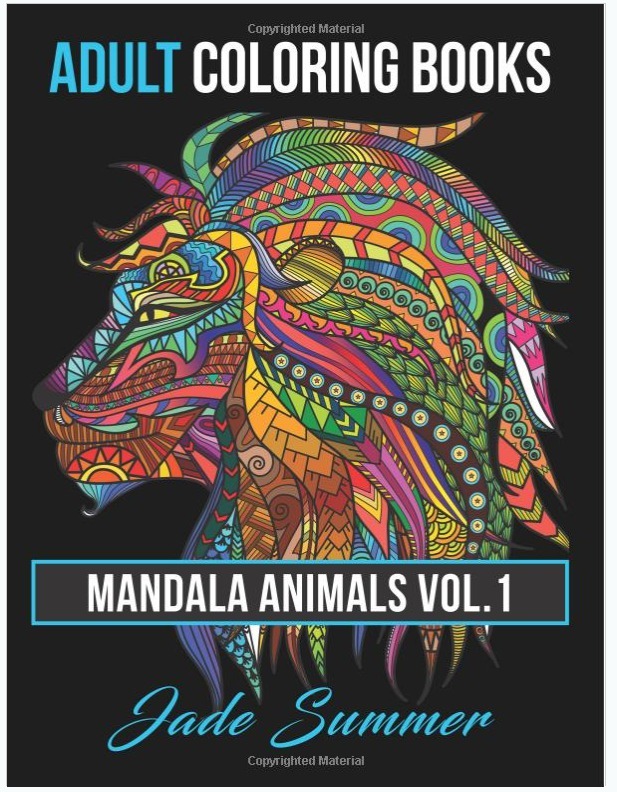 This is one of the best coloring books that feature mandala animals in each of the illustrations. You’ll find that your stress dissolves as you turn your focus to coloring the beautiful artwork in the book. There are a total of 25 unique images and each of them has a duplicate copy just in case you made mistakes or would like to try with different coloring styles. The quality of the paper is great compared to other adult coloring books. The back of the pictures are black and thus prevent bleeding onto the next pages. The pictures are clearly drawn and it made coloring easy even for a beginner. Getting this book for stress relief purposes is definitely a great decision. Besides the physical book, you’ll also get access to the digital version and the rights to print as many copies as you want after you made a purchase. Overall, the price is more than reasonable for 50 beautifully crafted pictures and high-quality paper. If you’re captivated by the intricated style of Mandala design, this is the perfect coloring book for you. The book features 50 Mandala designs that are picked from thousands that are submitted to the editors. Every single design in the book features well-balanced Mandala circular form. You’ll find that coloring through the intricate details helps in shifting focus away from stress. You can use a mixture of color pencils or crayons to bring art to life. While the pages are black on the back side, you’ll want to be cautious if you’re using marker pan as they may leak through the paper. This book is also a great gift for any of your loved ones who are recuperating from sickness or surgery as it helps them to cheer up. Parenting is tough. Moms know the best how it takes everything to retain their sanity with their kids running havoc all over the house. Peace can sometimes remain elusive even when the little ones have fallen asleep. 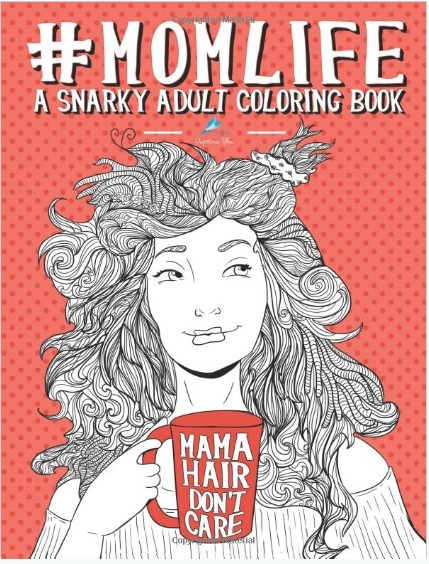 This witty adult coloring book is the perfect relaxation gift for moms. The book features 32 witty, snarky pictures for you to chill off over a cup of coffee. The paper is reasonably thick to prevent colors from bleeding through. This allows you to color with any painting medium of your choice. Besides reducing your stress, you’ll probably laugh yourself away when you find the humor in the pictures that you can relate personally. This coloring book is all you deserved for trying your best to be a great mom. With a premium matte-finish cover, it also serves as a perfect gift for any mom-to-be. 1. What Should I Use To Color The Coloring Books? There are different choices of stationery that you could use for coloring books. You’ll need to consider the pros and cons of different types of coloring tools before using them. For instance, it’s hard to be very precise with crayons as it is with color pencils or marker pens. But if you’re using markers, it may bleed through the paper on the coloring book and smudges the following page. 2. Can I Use Unconventional Colors For The Coloring Book? A child is taught that the sky is blue and the grass is green. But that may not necessarily be the case with adult coloring books. You have the free reign on the choice of colors to go along the theme of the book. It may not necessary makes sense but it’s important to allow your creativity to flow. 3. How Effective Is Adult Coloring Books In Relieving Stress? Some people are skeptical of the fact that coloring can help in reducing stress. The fact is, coloring benefits adults in various form and it shouldn’t be solely associated with fun-time for kids. The act of coloring demands your full attention on the act itself, leaving no room for worries and stress. The act of coloring is so effective in relieving stress that researchers have investigated its relevance as a form of art therapy. Try it out and you’ll gradually zone out from worries and stress. 4. 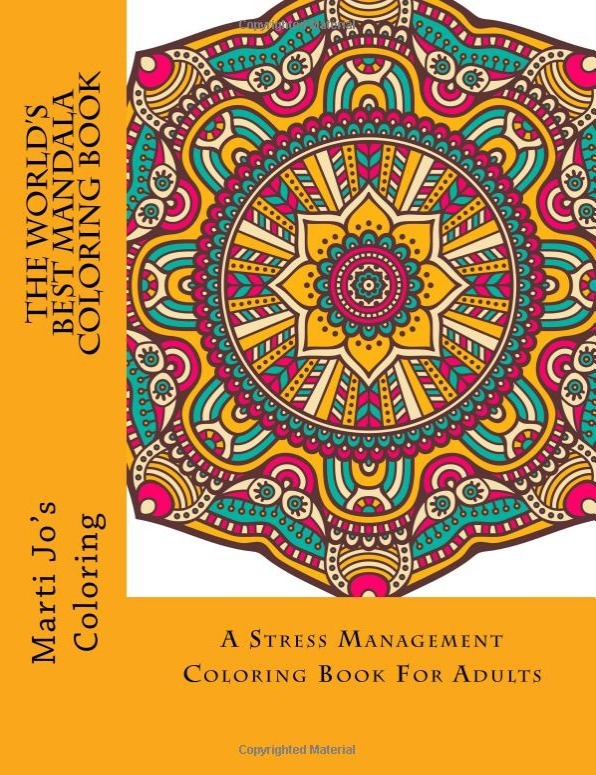 Do I Need To Be Good In Coloring To Destress With Adult Coloring Books? Don’t stress yourself out just because you can’t seem to keep the colors within the line. It’s ok not to be as good as you expect in coloring. Remember that there is no right or wrong in coloring an adult coloring book. It is the process where you’re focusing all your attention on coloring that matters. Feel free to break every elementary rule of coloring, or make a masterpiece out of a simple coloring book. What’s crucial is that you are feeling relaxed when you’ve finished a page. If you’re new to adult coloring books, here are some do’s and don’ts to help you get the most out of the experience. Choose coloring mediums that you are comfortable with. Some enjoy coloring with crayons while others prefer gel pens. If you’re using gel pens or markers, insert a piece of paper behind the page that you’re coloring to prevent any risk of bleeding. You’re not in a coloring competition, so take your time to enjoy the experience. Find a place that’s free of distraction to color. It helps you to relax and enhance your focus. There are no rights and wrongs. Forget any conventional standards on the choice of color, or the need to stay within the line. 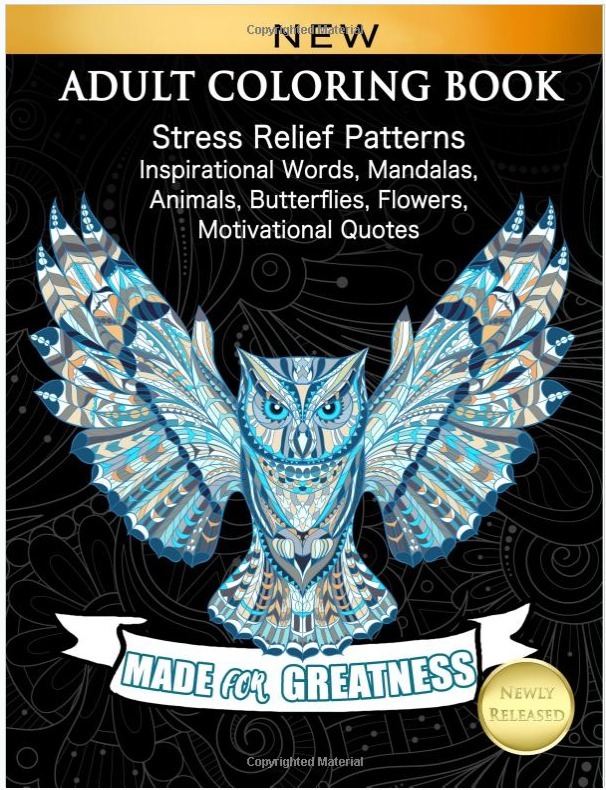 I hope that you’ve found yourself a perfect coloring book to relieve your stress. Let me know if coloring helps you to relax as it did for me.